Down in the lair, Donnie receives a video chat from April. She says “I love you” before the chat cuts off. Donnie, in his eagerness to accept April’s reciprocated affections, immediately orders flowers to be sent to April with the note, “I love you, too”. After placing the order, the chat line comes back on and April finishes her sentence, “I Love You Like a Blister is definitely the best album by the Squashed Wombats”. Donnie proceeds to freak the heck out and attempts to cancel the flowers, only to find the delivery service closed for the night. With no other options at hand, Donnie hops into his buggy to stop the delivery before it can reach April. 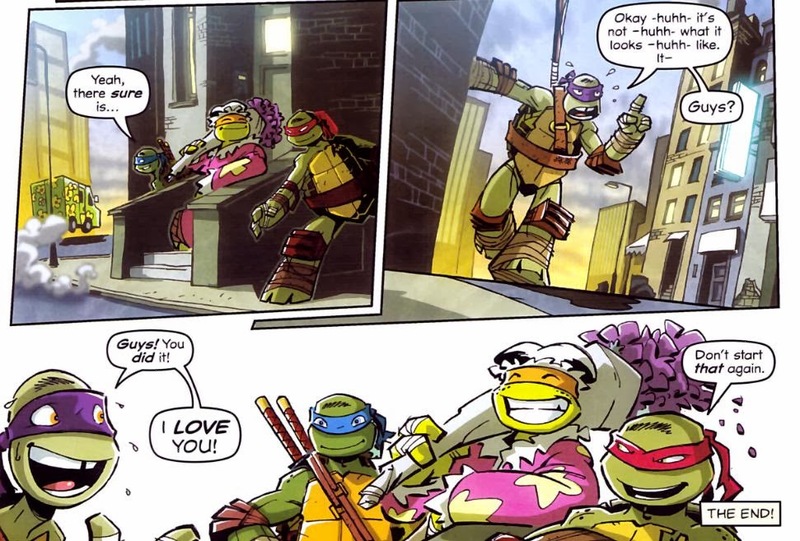 The other Turtles tag along to help, though Donnie insists he can resolve this embarrassing problem on his own. As they near the delivery van, they stumble upon a robbery. The Kraang have knocked over a facility called Space Tech and made off with some goods in their van. 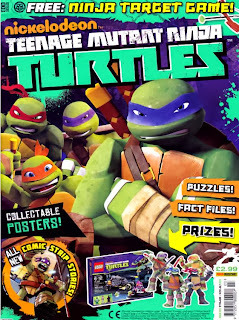 Much to Donnie’s dismay, the Turtles stray from their course and pursue the Kraang. Setting the buggies to “auto-drive”, the Turtles board the roof of the van and try to stop the drivers. The Kraangdroids climb up top and do battle, all the while Donatello panics that they need to wrap things up quickly. 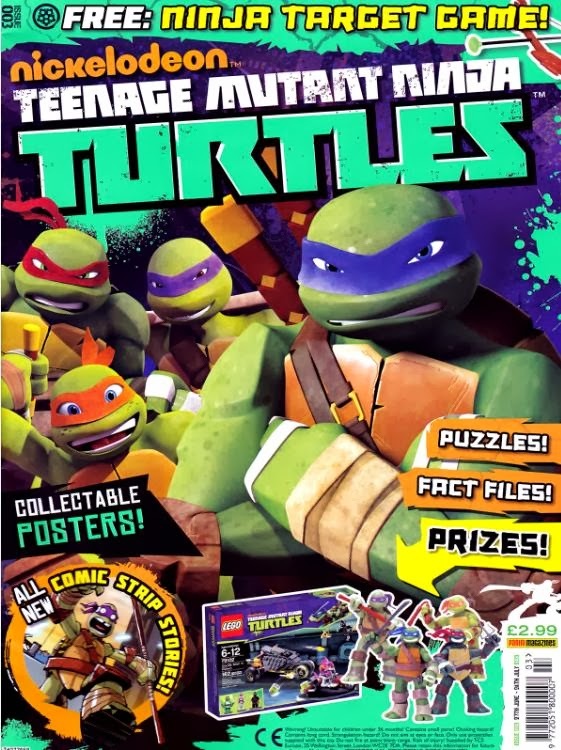 Mikey manages to get into the bed of the van and begins looking for whatever the Kraang stole. Donnie, in his haste, blocks the windshield and the Kraangdroid driving accidentally swerves through an alley (catching a clothesline full of women’s garments in the process). 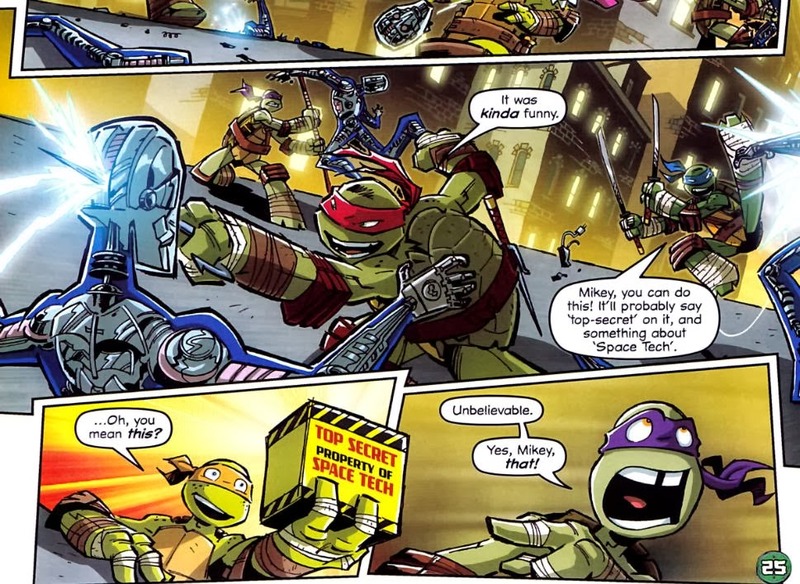 Eventually, Mikey finds the box labeled “top secret” and the Turtles bail just as the Kraangdroids drive the van straight into a wall. Donnie is pleased to get back to chasing the delivery van, but is unaware that his buggy took some damage and is leaking gas. The other Turtles notice and decide to lend their bro a hand, whether he wants them to or not. Sighting the van pulling up to April’s building, Donnie figures he has everything on lockdown... But then his buggy putters out a block from victory, leaving him no chance to stop the deliveryman before he reaches the door. The deliveryman is amount to mount the stoop when he's suddenly intercepted by Mikey in drag (the garments taken from the clothesline), claiming to be April O’Neil. Disgusted, the deliveryman hands over the flowers, asks for no confirmation of receipt and gets out of there. Donnie arrives in time to find that his brothers saved his skin (and reputation with April). Grateful, he tells them all he loves them. 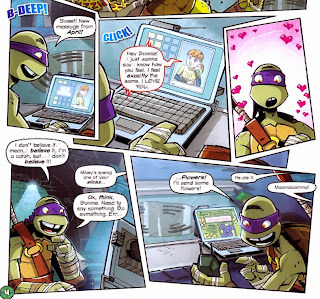 Raph rolls his eyes, urging Donnie not to throw that phrase around so lightly anymore. 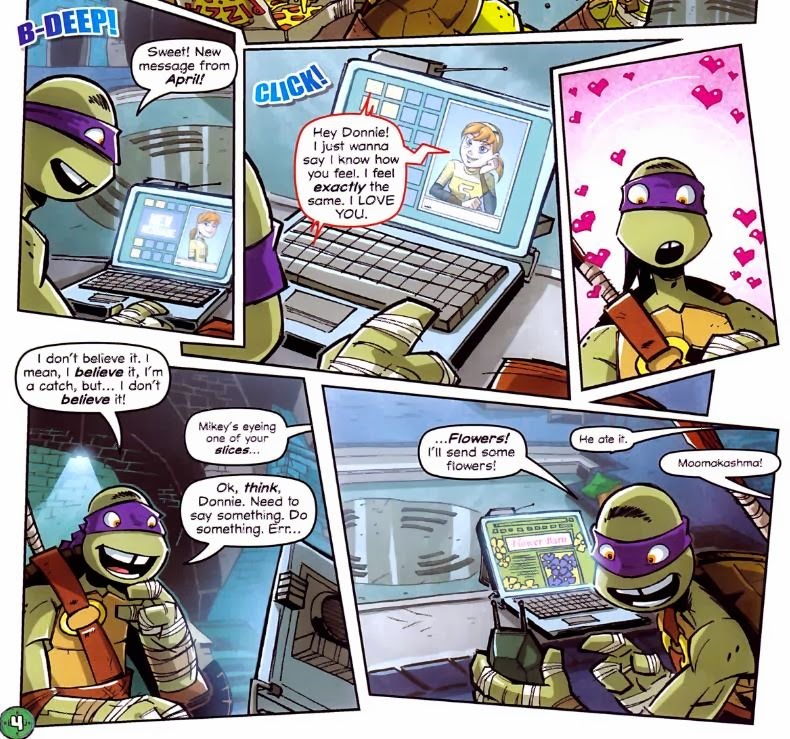 *This story is continued from TMNT Magazine (Panini) #2. 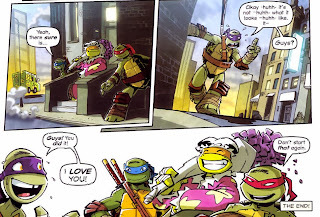 The story continues in TMNT Magazine (Panini) #4. *Since April is shown to still be living in her apartment and not hiding out in the sewer lair, that would indicate the issues so far have taken place before the episode "The Alien Agenda". Now this one was just great. It honestly felt like had the action and plot devices (such as the Space Tech package) been expanded upon a little, it could have easily made a solid episode of the TV series. The entire story flows really smoothly; a stupid mistake that gets the action rolling, a standard “wrong place, wrong time” coincidence that ramps up the suspense, and a funny comedy beat ending that feels natural to the story and not like a tacked on zinger. There’s even a “lesson” in the whole thing, about trusting your family/friends even in the most embarrassing of situations, but it isn’t laid on thick or spelled out for the reader. The whole thing just read really well. As usual, Caruana has a firm grip on the voices of the characters and all their quips and outbursts sound like something you’d hear in the cartoon. Even the redundant speech pattern of the Kraangdroids is successfully mined for humor, which for some reason I never get tired of. I suppose if anything feels like a speedbump in the story flow it’s the aforementioned plot device; the package from Space Tech. 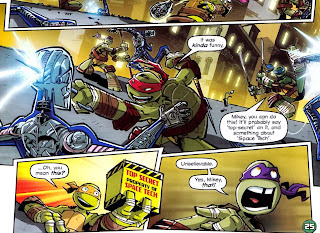 Really, it doesn’t matter so much what it is, just that the Kraang are after it so it can’t be good news. And the heart of the story was Donnie’s haste to catch the delivery van, so a lengthy diversion with the Space Tech thingy would have just eaten up what limited page space this comic has. Like I said, if this had been a full episode (or even a full comic; these strips are short), then yeah, the Space Tech thingamajig would need to have been fleshed out. But for a short story that moves at a breakneck pace, we got all the necessary info we needed. Probably my favorite of the Panini stories so far. Solid art from Lawrence, too, who does a great job imparting the sense of high speed and panic in his layouts and character expressions.